Yesterday I witnessed six Palestinian activists demand freedom, justice and dignity as they defied Israel’s apartheid policies when the group successfully boarded settler-only buses and attempted to enter East Jerusalem, where they were eventually brutally dragged off and arrested by the Israeli Occupying Forces (IOF). At the press conference and in the lead up to the event, the activists described how they had taken inspiration from the U.S. Civil Rights Movement and the heroic actions of Rosa Parks. Drawing on the struggles of African Americans who fought against segregation and inequality in the Unites States, and South Africans who battled against apartheid, the Palestinian Freedom Riders aimed to draw the world’s attention to the similarity of the struggle faced by the Palestinian people on a daily basis. However, it must be recognised that the formation and continued policies of Israel’s apartheid state have far superseded the actions of both the Jim Crow South in the U.S. and the white supremacists in South Africa. 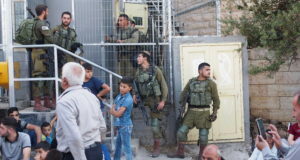 Only last week when visiting Ni’lin, I was told of how when the wall was being built (which stole 30% of Palestinian land from the people of this small village), the IOF imposed a four day curfew on the village. This was enforced night and day, and if the people tried to leave their homes, tear gas and sound bombs were fired relentlessly into the narrow streets. In South Africa, the white settlers sought to dominate the native population by incorporating them as inferior citizens in a state under exclusively white control. Zionism is founded upon a similarly colonialist ideology, but goes further in its attempts to establish a Jewish demographic through an ethnic cleansing of the Palestinian people from their land. Unlike in the American South of the 60s, you will not see signs around the settlements or at the checkpoints stating “No Palestinians here” – Israel manages its PR machine far too well for such overtly racist statements to be witnessed by the other “democratic” countries which fund its existence. Similarly, Palestinians are technically allowed to ride “settler-only” buses and drive on “settler-only” roads, something repeated by the Israeli media and the settlers who came off the buses yesterday. But the segregation, inequality and the denial of Palestinian’s rights to enter their own land is implemented in a far more covert way by Israel. Whilst Palestinians may be able to travel on the buses and roads, these buses lead either into the internationally recognisedillegal settlements, or into East Jerusalem where Palestinians are forbidden to enter. East Jerusalem is the intended capital of a future Palestinian state, yet Israel has denied the majority of Palestinians access to the city without a permit, which are almost impossible to obtain. 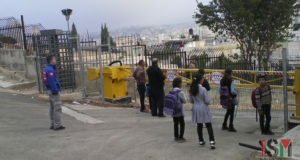 As a result, Israel has been able to continually expand the settlements in East Jerusalem, particularly in the highly contentious area of Sheikh Jarrah, and this has lead to the annexing of Palestinian populated areas in the city so that it is surrounded by Israeli settlements, systematically destroying the possibility of having a Palestinian controlled capital. As I hope is becoming evident, the Palestinian Freedom Riders movement is not simply about the segregation of buses, the problem here is much larger. Palestinians face an apparatus of military control over Palestinians that needs to be dismantled, along with the settlements themselves. The Israeli government will continue to defend their denial of Palestinians into East Jerusalem and the segregation of settler buses and roads because of the “security” threat from suicide bombings, their continual excuse and reasoning behind the occupation of Palestine. However, Israel’s colonialist project and abhorrent treatment of Palestinians began long before the first suicide bombing took place, and the continued occupation will do nothing to deter the desperate and destructive acts of suicide bombers. 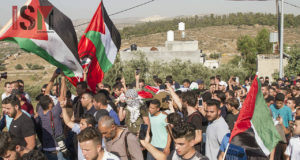 However, the violence that has blighted the region for many years was far from the minds of anybody who witnessed the Palestinian Freedom Rides yesterday, as they took part in a determinedly non-violent resistance that attempted to demonstrate the popular, direct action movements which have been been gaining momentum in Palestine to resist Israeli occupation. Yesterday’s action was a well orchestrated media circus, with hundreds of journalists swarming around the riders trying to get the best shots and interviews for their stories. However, in order for the Freedom Rides to have a true impact on Palestinians living in the Occupied Territories, they will need to engage the wider Palestinian community and encourage these acts of civil disobedience in the next waves of the Freedom Rides. I have every faith that the activists involved in the initial wave will continue tirelessly to do so, facing arrest by the Israeli forces and attack by the settlers at every turn. Furthermore, the onus is now on people around the world not to co-operate with the apartheid policies of the Israeli regime and to take action against them, starting with the boycott of companies – such as Egged and Veolia who run the settler buses – who profit from Israel’s illegal apartheid system. This protest was not about the UN Statehood Bid. It had nothing to say about armed struggle. Instead, this is one of the most inspiring acts of people power I have seen since arriving in Palestine. The Freedom Riders are demanding that their very basic human rights are upheld in accordance with international law, and to demonstrate that they will continue to engage non-violently to win the freedom, justice and dignity for which the Palestinian people have struggled for so long. Holly is a volunteer with International Solidarity Mvoement.